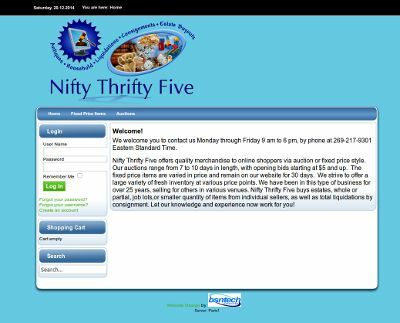 BsnTech Networks was contacted by Jack several months ago in regards to getting a website created for his small business, Nifty Thrifty Five. He also requested that we make a logo for his website. We wrote about the logo design in a previous blog post, but today – we have published the Nifty Thrifty Five website! Jack is still working on the site and getting the feel for how to manage and maintain it. His website incorporates a standard eCommerce system with a USPS shipping plugin for automatic rates. This way he can sell fixed price items on his site. In addition, he also wanted to be able to list auctions on the site. The auction site is setup so that only he may post the items, but BsnTech Networks also has the ability to make auction websites that allow memberships and members to post items for auction as well. We appreciate the business from Jack! The Nifty Thrifty Five website is at niftythriftyfive.com.